I will be at the Easter Extravaganza in the Pavilion Gardens, Buxton on Good Friday 19, Saturday 20, Easter Sunday 21 and Easter Monday 22 April. I will have my full range of products with me. Back in the Midwest I will be at the North Shore Unitarian Church in Deerfield on 27 & 28 April and then at Art in the Park, Elmhurst on 4 & 5 May. My full schedule of events for the year can be seen here. I have further reduced the price of many of the books in the Special Offers section of the shop on my website to just £5. They may be purchased here. My new range of Greeting Cards can be seen on my website here. They may be purchased in my website shop here. I am offering my discontinued earlier designs at the exceptional price of 20 cards for £10. They may be purchased here. I have designed a shoulder bag with one of my Sagely Sayings on either side. The bags can be seen here and may be purchased from my website here. I have allocated six weekend days for Workshops in the UK in 2019. They cover Bookmaking, Printing on Fabric and Art Journaling. Details may be seen here. I have rearranged my website to facilitate a separate section for my textile collages, which can be seen here. My current range of mounted Sagely Sayings textile collages can be ordered from my website in 10"x 8" unframed format, here. The Teesha Moore stamps are going fast and if you want any please order them as soon as possible. I cannot get any more of these. Following her stroke Teesha has stopped selling rubber and so there won't be another chance! I offer a range of workshops for those who are interested in my techniques. Details of all of them can be seen here. If you have a group (two or more) who would like to attend a workshop at a time of your own choosing, either weekday or weekend, contact me to make arrangements. I can travel to hold a workshop at a venue of your choice or adapt the format to suit your time requirements. In the UK they will be held in my studio during the autumn and winter months. In the summer they will be held on the terrace under gazebos. In the US I need a venue for workshops. We don't need a great deal of space as long as there is a flat surface to work on. If it is a small group (2-4) we can use a kitchen table. Alternatively we could hold the workshop outside during the summer months if you have a suitable space. Contact me to discuss arrangements. ​I will be at Levenshulme Market on Saturday 13 April. I will have with me my new range of Greeting Cards as well as the excellent value Clearance Packs. My next Midwest events are at the North Shore Unitarian Church on 27 & 28 April and then at Art in the Park, Elmhurst on 4 & 5 May. 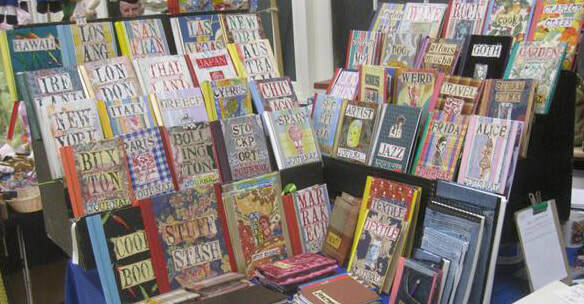 ​I will be at Levenshulme Market on Saturday 30 March. My schedule of events for the year can be seen here. I have allocated six days for Workshops in the UK in 2019. They cover Bookmaking, Printing on Fabric and Art Journaling. Details may be seen here. I have rearranged my website to facilitate a separate section for my textile collages, which can be seen here. 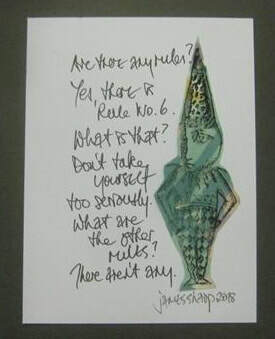 My current range of Sagely Sayings textile collages can be ordered from my website in 10"x 8" unframed format, here. I have split books and mounted textile collage into separate pages in the Special Offers and Clearance Items shop on my website to make browsing simpler. I have continued to reduce the prices of items on the Sale page of my website. The Books page is here and the mounted textile collages is here. I have an ongoing requirement for new or used envelopes. All sizes are welcome and any quantities will be gratefully received. Thanks to Joan for her contribution last weekend. If you are not planning to attend any of the fairs where I will be in the near future please contact me and I will try to arrange to collect them. ​My new range of Greeting Cards can be seen on my website here. They may be purchased in my website shop here. I am offering my discontinued earlier designs at the exceptional price of 20 cards for £10. They may be purchased here. My first Midwest event is the Shower of Crafts at the College of DuPage, Glen Ellyn on Saturday 23 & Sunday 24 March. I am looking forward to seeing customers and friends at this event. My schedule of events for the year is filling up and can be seen here. I have an ongoing requirement for new or used envelopes. All sizes are welcome and any quantities will be gratefully received. Thanks to Ellie for her recent contribution. If you are not planning to attend any of the fairs where I will be in the near future please contact me and I will try to arrange to collect them. My first Midwest event is the Shower of Crafts at the College of DuPage, Glen Ellyn on Saturday 23 & Sunday 24 March. My schedule of events is filling up and can be seen here. I have updated my range of Greetings Cards and have discontinued my ealier designs which I am offering at the exceptional price of 20 cards for £10. They may be purchased here. I offer a range of workshops for those who are interested in my techniques. Details of all of them can be seen here. If you have a group (two or more) who would like to attend a workshop at a time of your own choosing, either weekday or weekend, contact me to make arrangements. I can travel to hold a workshop at a venue of your choice or adapt the format to suit your time requirements. In the UK they will be held in my studio during the autumn and winter months. In the summer they will be held on the terrace under gazebos. I have added some pictures taken in January to the Garden page of my website. ​I will be at the Craft & Jewellery Fair at the Pavilion Gardens, Buxton on Saturday 23 and Sunday 24 February. I will have my full range of products with me. My schedule of events for 2019 is filling up and can be seen here. I have rearranged my website to facilitate a separate section for my textile collages, which can be seen here. My current range of textile collages can be ordered from my website in 10"x 8" unframed format, here. ​I have scheduled six days for Workshops in the UK in 2019. 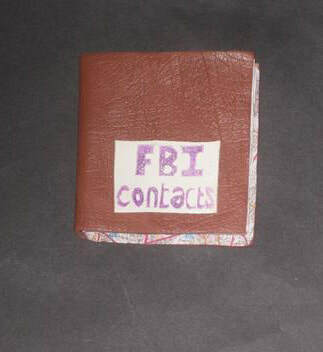 They cover Bookmaking, Printing on Fabric and Art Journaling. Details may be seen here. My first event of the year will be the Craft & Jewellery Fair at the Pavilion Gardens, Buxton on Saturday 23 and Sunday 24 February. I will have my full range of products with me. ​I have a large range of product at vastly reduced prices in the Clearance section of the shop on my website. There is no charge for local postage on purchases made from my website. I have an ongoing requirement for new or used envelopes. All sizes are welcome and any quantities will be gratefully received. Thanks to Suzy who provided an enormous stash of cards, envelopes and hard back books.If you are not planning to attend any of the fairs where I will be in the near future please contact me and I will try to arrange to collect them. ​My final event of the year will be at Levenshulme Market on Saturday 15 December. It will be an excellent opportunity to buy affordable framed and unframed textile mounted collages as well Journals, Leather and Denim covered books and there will also be a range of books on special offer. You will also be able to buy my fully lined heavy duty shoulder bags at the amazing price of just £9! My Art Aprons are the perfect unusual gift and I will have them with me as well. I will add to my schedule of events for 2019 as they get firmed up. My regular products may be purchased in the shop on my website and the last date for UK posting is Monday 17 December. I return to Chicago on December 18 and can mail any items to US customers then. I have many items that are suitable as stocking stuffers or small gifts for colleagues such as my Little Leather Books and Leather Lists Books. The latter can be customised with the recipients initials to personalise the gift. Contact me to discuss any particular requirements. There are many bargains to be had in my Special Offers and Clearance Shop and I have also reduced the prices of many items in this shop. There is no charge for local postage on purchases made from my website. ​I will be at the Pavilion Gardens, Buxton for the Christmas Fair on, Saturday 8 and Sunday 9 December. It will be an excellent opportunity to buy affordable framed and unframed textile mounted collages as well Journals, Leather and Denim covered books and a range of books on special offer. You will also be able to buy my fully lined heavy duty shoulder bags at the amazing price of just £9! My Art Aprons are the perfect unusual gift and I will have them with me as well. My final event of the year will be at Levenshulme Market on Saturday 15 December. My regular products may be purchased in the shop on my website and those who want to use my Journals and other items as gifts during the Christmas period should order as soon as possible if they are unable to visit any of my scheduled events. I return to Chicago on December 18 and can mail any items to US customers then. If you would like me to customise any other item for you to give as a Christmas gift please contact me as soon as possible to discuss it to give enough time for production and mailing. Examples of recent commissions as well as earlier work can be seen here. I have an ongoing requirement for new or used envelopes. All sizes are welcome and any quantities will be gratefully received. Thanks to Jane and Christine who handed over their collections last week. If you are not planning to attend any of the fairs where I will be in the near future please contact me and I will try to arrange to collect them. I have added some October photos to the Garden Page of my website. ​I will be at the Pavilion Gardens, Buxton for the Grand Bazaar on Friday 23, Saturday 24 and Sunday 25 November. I will be at Levenshulme Market on Saturday 1 December. I have an ongoing requirement for new or used envelopes. All sizes are welcome and any quantities will be gratefully received. Thanks to Judy for her latest collection. If you are not planning to attend any of the fairs where I will be in the near future please contact me and I will try to arrange to collect them. ​I will be at the Woman's Club of Evanston Holiday Bazaar, 1702 Chicago Avenue, Evanston on Friday 16 November (5pm-9pm), Saturday 17 November (10am - 5pm) & Sunday 18 November (noon - 4pm). The Friday event is a Benefit Party, but admission is free on Saturday and Sunday. This will be my last event in the Midwest this year. I will be back at the Pavilion Gardens, Buxton for the Grand Bazaar on Friday 23, Saturday 24 and Sunday 25 November. My regular products may be purchased in the shop on my website and those who want to use my Journals and other items as gifts during the Christmas period should order as soon as possible if they are unable to visit any of my scheduled events. ​On Sunday 11 November I will be at the Holiday Boutique, Beth Hillel Bnai Emunah Sisterhood, Big Tree Lane, Wilmette. On Friday 16 November (5pm-9pm), Saturday 17 November & Sunday 18 November I will be at the Woman's Club of Evanston Holiday Bazaar, 1702 Chicago Avenue, Evanston. I have many items that are suitable as stocking stuffers or small gifts for colleagues such as my Little Leather Books and Leather Lists Books. The latter can be customised with the recipients initials if required. Contact me to discuss any particular requirements. I have an ongoing requirement for new or used envelopes. All sizes are welcome and any quantities will be gratefully received. Thanks to Joan who delivered a stash to Glen Ellyn last weekend. If you are not planning to attend any of the fairs where I will be in the near future please contact me and I will try to arrange to collect them. ​I will be at A Holiday Happening, College of DuPage, Glen Ellyn on Saturday 3 & Sunday 4 November. On Sunday 11 November I will be at the Holiday Boutique, Beth Hillel Bnai Emunah Sisterhood, Wilmette. My regular products may be purchased in the shop on my website and those who want to use my Journals and other items as gifts during the Christmas period should order as soon as possible if they are unable to visit any of my scheduled events. I have many items that are suitable as stocking stuffers or small gifts for colleagues such as my Little Leather Books and Leather Lists Books. The latter can be customised with the recipients initials if required. Contact me to discuss any particular requirements. I have an ongoing requirement for new or used envelopes. All sizes are welcome and any quantities will be gratefully received. Thanks to Judy for her latest offering. If you are not planning to attend any of the fairs where I will be in the near future please contact me and I will try to arrange to collect them. ​I will be at A Country Christmas Arts & Craft Show , Crystal Lake South High School on Saturday 27 & Sunday 28 October. I will then be at A Holiday Happening, College of DuPage, Glen Ellyn on Saturday 3 & Sunday 4 November. If you would like me to customise any items for you to give as a Christmas gift please contact me as soon as possible to discuss it to give enough time for production and mailing. Examples of recent commissions as well as earlier work can be seen here. I have an ongoing requirement for new or used envelopes. All sizes are welcome and any quantities will be gratefully received. Thanks to Peter who handed over another stash recently. If you are not planning to attend any of the fairs where I will be in the near future please contact me and I will try to arrange to collect them. ​I will be at the Artist & Designer Fair in the Octagon at the Pavilion Gardens, Buxton on Saturday 20 & Sunday 21 October. This is the main quality event held at Buxton and it will be an excellent opportunity to make inroads into your Christmas shopping. Saturday 27 & Sunday 28 October- A Country Christmas Arts & Craft Show , Crystal Lake South High School. Saturday 3 & Sunday 4 November- A Holiday Happening, College of DuPage, Glen Ellyn. Sunday 11 November - Holiday Boutique, Beth Hillel Bnai Emunah Sisterhood, Wilmette. If you would like me to customise any of my products for you to give as a Christmas gift please contact me as soon as possible to discuss it to give enough time for production and mailing. Examples of recent commissions as well as earlier work can be seen here. ​I will be at The Great Peak District Fair in the recently re-opened Octagon, Pavilion Gardens Buxton. This is the annual celebration of arts and crafts made in the Peak District. There will be outdoor activities for all the family as well as the quality crafts in the Octagon. I return to the Pavilion Gardens, Buxton on Saturday 20 & Sunday 21 October for the Artist & Designer Fair. All my regular products may be purchased in the shop on my website and those who want to use my Journals and other items as gifts during the Christmas period should order as soon as possible if they are unable to visit any of my scheduled events. I have an ongoing requirement for new or used envelopes. All sizes are welcome and any quantities will be gratefully received. Thanks to Karen who delivered her latest batch to Buxton last week. If you are not planning to attend any of the fairs where I will be in the near future please contact me and I will try to arrange to collect them. The Octagon at Buxton has, at long last, reopened and I will at the Craft & Jewellery Fair on Saturday 6 & Sunday 7 October. I will also be there on Saturday 13 & Sunday 14 October for The Great Peak District Fair and on Saturday 20 & Sunday 21 October for the Artist & Designer Fair. If you have a group (two or more) who would like to attend a workshop at a time of your own choosing, either weekday or weekend, contact me to make arrangements. I can travel to hold a workshop at a venue of your choice or adapt the format to suit your time requirements. In the UK they will be held in my studio during the autumn and winter months. In the US I need a venue for workshops. We don't need a great deal of space as long as there is a flat surface to work on. If it is a small group (2-4) we can use a kitchen table. Alternatively we could hold the workshop outside during the summer months if you have a suitable space. Contact me to discuss arrangements. I have an ongoing requirement for new or used envelopes. All sizes are welcome and any quantities will be gratefully received. Thanks to Sara who brought a large accumulation to Levy. Thanks also to David who unloaded sackfulls on me in Devon! If you are not planning to attend any of the fairs where I will be in the near future please contact me and I will try to arrange to collect them. ​I will be at Levenshulme Market on Saturday 22 September. ​I will be at the Festival of the Vine, Geneva on Saturday 8 and Sunday 9 September. I will be at the Girls Nite Out at Wilder Mansion, Elmhurst on Wednesday 12 September. The event will run from 4- 9pm. I have an ongoing requirement for new or used envelopes. All sizes are welcome and any quantities will be gratefully received. Thanks to Sherie and Pat who brought thir collections to Deer Park last weekend. If you are not planning to attend any of the fairs where I will be in the near future please contact me and I will try to arrange to collect them.